We are having a productive season at SupportEd with EL Master Plan partnerships and ongoing technical assistance projects, face-to-face professional development (PD) in several states, multiple presentations, and five upcoming online summer professional development courses. Jefferson County Public Schools, Kentucky. We are working with JCPS to develop a new EL Master Plan for the district’s growing English learner population. We have conducted a needs assessment and met several times with various stakeholders to develop a plan that will define a clear pathway to ELs’ success in JCPS. Reading School District, Pennsylvania. We are working with Reading School District (RSD) to develop their first EL Action Plan (or Master Plan) for the district’s rapidly growing English learner population. The first step of our work was conducting a needs assessment which includes a review of policies and procedures, student data, classroom observations, and interviews with stakeholders to determine current strengths and needs of the program. Next, we are meeting with groups of internal and external stakeholders to solicit additional input for plan development. SupportEd will include the feedback and input from the district on an ongoing basis as the final EL Action Plan is developed. Additionally, SupportEd will be collaboratively working with RSD to review and revise EL program models and the English language development instructional delivery plan, and develop a professional development plan, a K-12 ESL standards-aligned curriculum, and an ESL Program Handbook. School District of Philadelphia, Pennsylvania. In partnership with co-teaching expert Dr. Andrea Honigsfeld, we are participating in a three-year project designed to support School District of Philadelphia (SDP)’s “Together is Better” initiative. The program is designed to pilot and research effective co-teaching models in grades K-3 in three SDP schools. We are conducting a multifaceted model of PD including classroom walk-throughs and coaching as well as face-to-face PD for participating ESL and K-3 teachers led by EL expert Kent Buckley Ess. Syracuse City School District, New York. We are continuing our fifth year of our ongoing collaboration with the Syracuse City School District (SCSD) to develop and enhance their programming for ELs, including dual language and English as a New Language. This year, we are lending targeted expertise in the area of literacy for ELs. Edmonton Public Schools, Canada. We are working with Edmonton to provide support for a face-to-face book study on our bestselling book Unlocking English Learners’ Potential. This book study combines face-to-face meetings hosted in Edmonton, activities for teachers to experience strategies from the book, and an online platform of materials and resources including video clips of authentic classrooms. The book study also includes live virtual Q&A sessions with authors Diane Staehr Fenner and Sydney Snyder. Mid-West Regional Bilingual Education Resource Network (RBERN), New York. SupportEd is conducting a 4-part blended professional development (PD) series entitled Leading Secondary ELLs to Graduation: Equitable Instruction and Assessment Practices for ESOL and content area teachers. Framed around our bestselling book Unlocking English Learners’ Potential, we are focusing specifically on scaffolding both instruction and assessment for ELs and our own 5 Pillars of Equitable Grading for ELs. The PD package consists of face to face sessions, online PLCs, classroom and onsite support with our colleagues at the RBERN as well as practical application in the classroom. Participants share their products designed for ELs (e.g., universal scaffolds and scaffolded lesson plans) through online PLCs designated for each of the content areas: ELA, math, science, and social studies. Professional Development for Multiple School Districts. We are providing ongoing professional development on many EL-related topics, including culturally responsive instruction, instructional strategies for supporting ELs in content classrooms, instruction of SLIFE, and teacher advocacy and leadership in support of ELs. This spring, we are collaborating with educators in several districts and organizations in Georgia, Indiana, New Jersey, New York, Pennsylvania, Virginia, South Carolina, and Wisconsin. 2019 Migrant Education Program /English Language Development Conference. In April, Sydney Snyder will facilitate an interactive workshop entitled Using Academic Conversations to Support ELs’ Acquisition of Academic Language and Content at the 2019 Migrant Education Program and English Language Development Conference in Harrisburg, PA. The statewide conference estimates more than three hundred attendees for 2019’s conference theme of Education Without Borders — United We Learn. KYC-EL 2019 Conference. In June, Diane Staehr Fenner will keynote and present at the Kentucky Coalition for English Learners Inaugural Summer Institute in Louisville, Kentucky. The keynote will address issues and strategies surrounding advocacy for diverse ELs in Kentucky, and presentation topics will include strategies for building ELs’ academic language, scaffolding for ELs, advocacy for ELs, and more. Our Kids Summer Institute 2019. In June, Diane Staehr Fenner will keynote and present at the 15th Annual Our Kids Summer Institute in Ankeny, Iowa. The two-day conference provides PK-12 educators the opportunity to discover new strategies for working with ELs and enrich practices for increasing EL achievement. 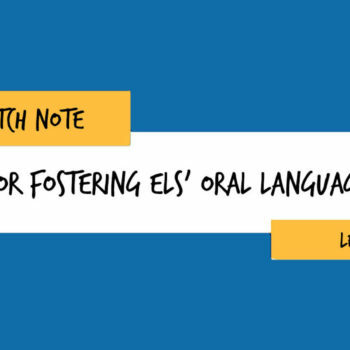 Topics include strategies for supporting core content learning and building academic language, EL parent engagement, and the benefits of co-teaching for ELs. This summer, we are proud to be offering five online courses. In addition to our popular courses on SLIFE, advocacy for ELs, strategies for making content accessible, and academic language, we are excited to introduce a new course built around strategies for creating culturally responsive school climates. All courses provide flexible, self-paced learning, a professional learning community facilitated by our team of EL experts and bestselling EL book authors, and a certificate for 10 hours of professional development upon satisfactory completion. We invite you to click below and learn how you can collaborate with us this summer on pressing EL education topics and solutions.